M4 Firmware v2.0.5 beta 8 now available. Unpack to root of your microSD. Fix |longname / C_FSTAT bug, now (again) displaying long filenames properly. Fix Hack menu - Slowdown keyboard reading. Added Hack menu - Support full keyboard character set (QWERTY only for now). Awesome. That's going to boost the M4 utilities development dramatically. If this is what you want to do I can correct the QWERTY one to include only AMSDOS allowed characters as well. Cool, thank you so much @dxs ! Will add it soon. 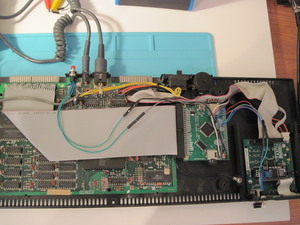 As for the QWERTY one, I will clean it myself, I can allow for some more characters than AMSDOS, since it will only save to microSD , so what's allowed with FAT32, or lets rather say OS restrictions. These will not be allowed, maybe there is more : * ? < > | "
Which I don't have in my (lowerrom stolen) font. It can be used as sort of a breakpoint to see, regs and mem for debugging yes. Be aware, if you interrupt while a command is being sent to the M4, the part of the command that was send will be lost when resumed (maybe I will think of a solution for this). In fact the hack menu might crash. So you would most likely, just do a "endless: jr endless" in your code where you want to check out things. M4 Firmware v2.0.5 beta 9 now available. Fix Hack menu - Flaw in IM 2 detection. Fix Hack menu - Resume "some games" (Pinball Fantasies, atleast on my one CPC). Added Hack menu - AZERTY keyboard support (Huge thanks to @dxs for the painful keymap table! And thanks to @ZbyniuR for the keyboard detection method). M4 Firmware v2.0.5 beta 10 now available. Added ability to launch hack menu via external button. 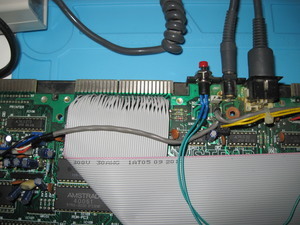 It requires soldering two wires to the M4 PCB (the wifi module). If you are happy not using Hack Menu or just launching it from the WEB interface, no reason to make this modification. 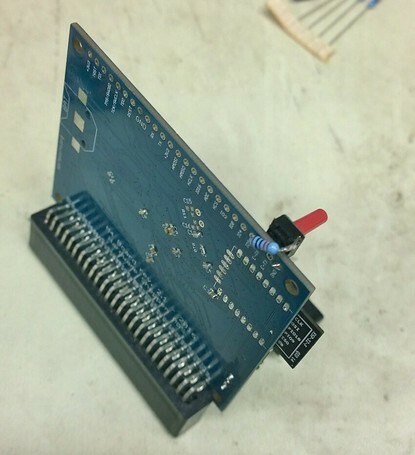 If you decide to solder on the switch, be aware it is at your OWN risk. 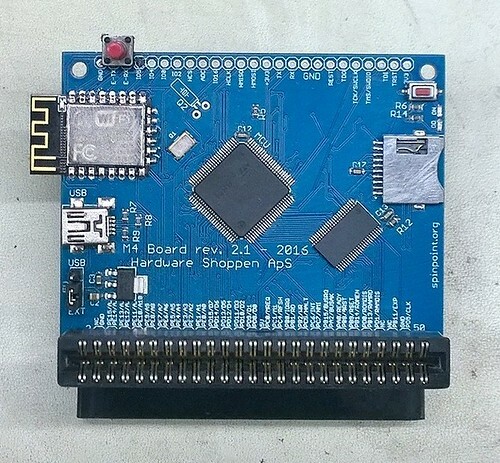 Be careful not to short the wires to the metal housing of the ESP12F module. I recommend to isolate the wires at the resistor and button to avoid an accidental short. The instructions in the below pictures. Rennert > very nice switch install.My M4 is not like yours, so I cannot do the same. Yes, nice mod by @Rennert . In fact those with rev. 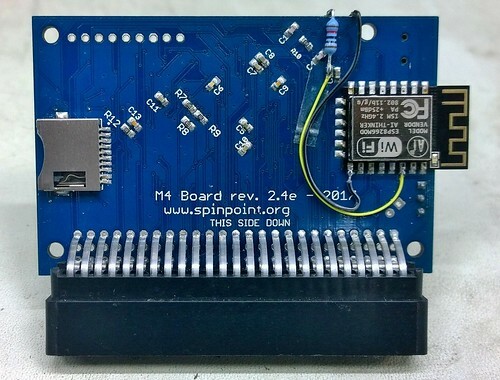 <=v2.4D boards can take both signals from the top header. If you have IO5 label on the top header, you can take it from there as well as GND. 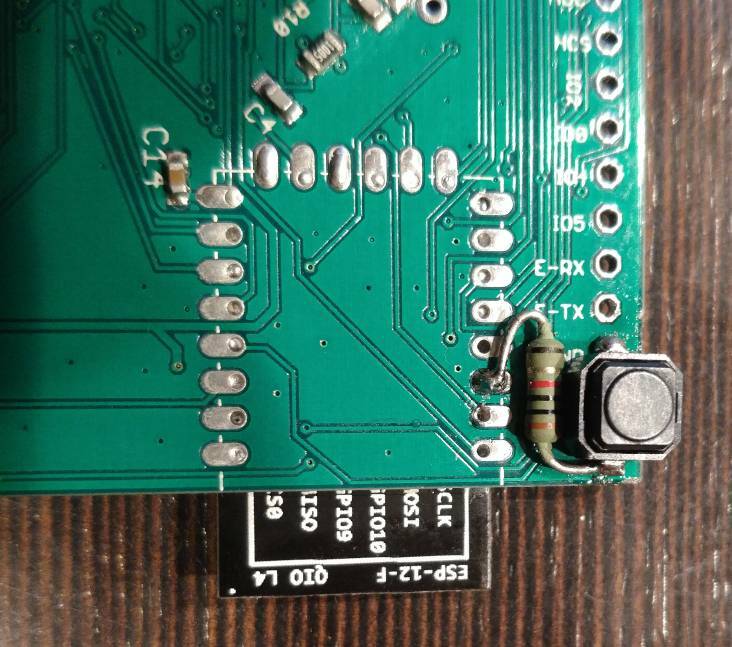 Yes with SMD resistor can place the button directly between GND and IO5. But I like the button on outer edge. Hi Duke! Great update! Just gave you like #999, would give you 999 more if possible. Just awesome!!! Enabling the hack menu with a button is awesome! The AZERTY support works perfectly, apart maybe from missing "é è à", and "^" which returns "(up arrow sign)". Absolutely not very important at all :-) Maybe slow down a bit the up down selection in the main hack menu, sometimes I get double line changes (like in previous beta when typing snapshot name). I also got (uncommon) crashes when saving in games, would providing the .sna help diagnose the failure mode? 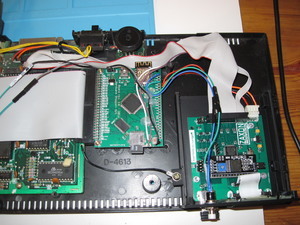 Here is my M4 setup if this can give some ideas, the hack switch is just above the USB stick of the drive, the red button behind (in the 12v plug hole) is the M4 reset switch. Just tell me the games, which do occasionally crash, then I can try to test those. Be aware that any navigation in the webui or ie. loading via the M4 while pressing the hack button, may result in a crash. 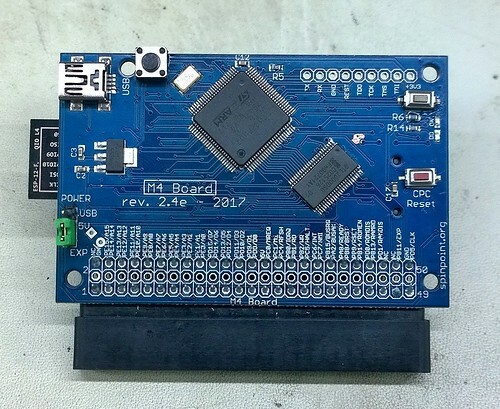 It's cause any ongoing M4 commands will be corrupted, so safest bet is probably to pause a game then, activate hack (or be sure it's not in the process of loading from the microSD). I will work on a solution so M4 commands can be interrupted without corruption. 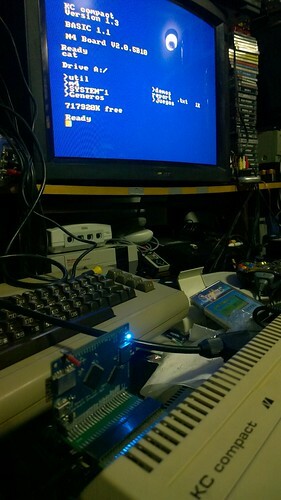 I got a crash tonight in Arkanoid (a trained one out of a huge cracked game pack - can provide game files). Doesn’t crash very often at all, maybe depends on power ups or something else in game. I had no computer connected to the WiFi , just the CPC on its own. The crash happened when resuming from hack menu, and later launching the saved .sna resulted in the same crash. nice install.but by using your M4 card, you don't no need any more a Gotek drive.install back the original 3" floppy drive. There are lots of buggy Arkanoid versions out there (problems after some levels or near the end). If there are problems with a game on M4 card, then it's good to test the disc version on real disc too. Often the crack has problems per se. Also, it's good to use the newest firmware update. I just did the mod on my M4. I had only one resistor of 2K ohms but it do the trick too. here it is some pictures: I realised that the game RAMBO doesn't break by pressing the hack switch. Savestates/snapshots work like a charm -thank you very much for it! I am trying to launch the GnG CPC+ version of xifos (http://www.cpcwiki.eu/forum/games/ghosts'n-goblins-gx4000-is-out-!/msg160770/#msg160770) but it doesnt work, either using web interface or ctrup and ctr RSX commands. Did someone already try this CPR file ? 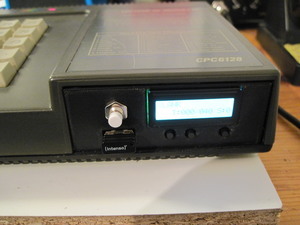 Another question, I try to use firmware 3.1.2 english as my CPC+ is french and hibernated 1 doesnt like it (cant use the letter M). I check lower rom, upload it in slot 31 but I still have the regular lower rom. Is it possible with a CPC+ ?